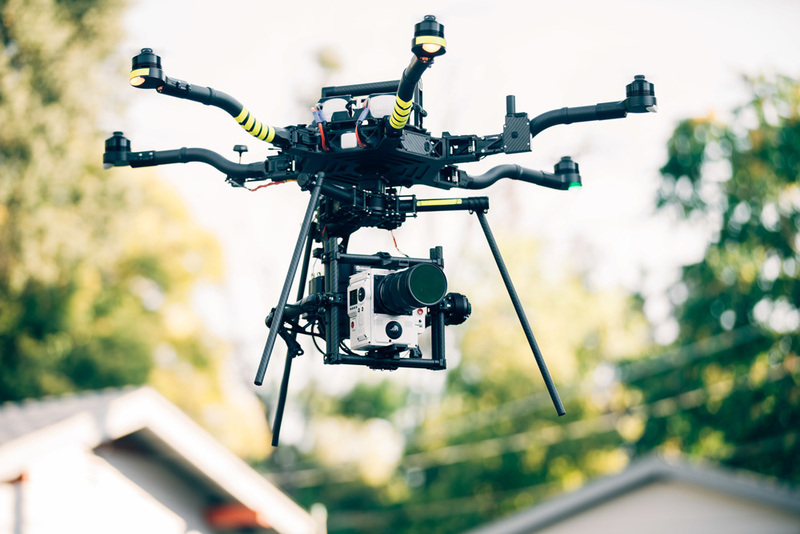 Earlier we reported that the first released footage of the new RED Helium sensor was graded with the help of our LUTs. 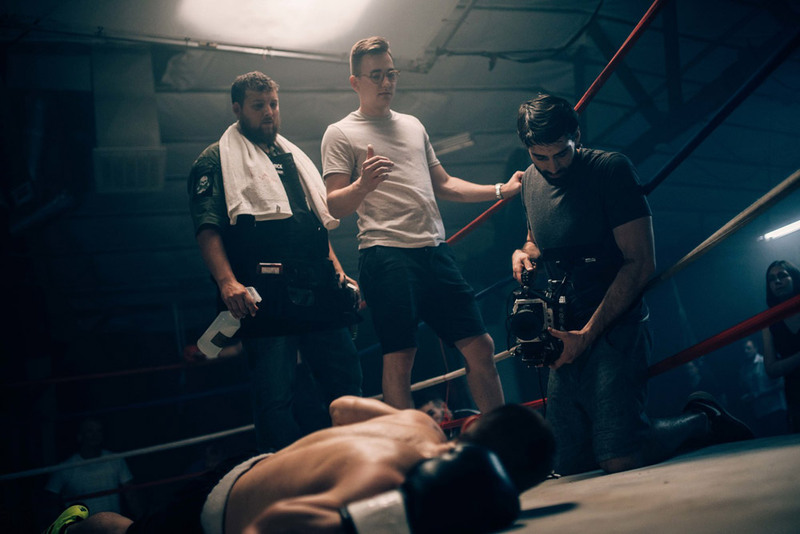 In order to learn more about the workflow, what’s it like to work with 8K .r3d files and what did it take to make ‘The Underdog‘, we sat down (well virtually) for an interview with Jonny Mass, the man behind the short film. At only 19, Jonny is one of the most talented young filmmakers out there. First, if you haven’t watched it yet, here’s is the short in half its glory in 4K. For how long have you been a filmmaker? What made you pick up the camera in first place? “I used to be into lots of different action sports when I was younger and I was always making videos of my friends. That’s when I bought my first DSLR and starting shooting everything I possibly could. Now that I look back on it I can remember a specific time where it went from just filming wide shots of them as they flew by, to actually directing the motion and setting them up for different sequences. It just kept progressing from there as I ramped up production quality and talent. I began to get into photography where I started shooting for a few magazines in my area and shortly after that I began shooting weddings. At the time I was still in high school so it was great money and if it meant I never had to work for anyone, than it was good enough for me. I never grew up wanting to be a movie director although I loved the art of cinema. In this day and age it’s different, it’s no longer go to film school and work your way up from a PA. I saw a different route… that’s what ultimately led me to the position I’m in now doing the projects I’m passionate about, with clients I’ve dreamed of working with. I love advertising and everything that surrounds it, from dealing with agencies to pitching the concepts, to executing the productions. Is it the same things that get you going today as it was back then? If not, what is it now that drives you? “Absolutely, anything that revolves around action I’m in game. I love to get the camera moving as much as possible when it’s fitting the story. Tell me about the RED Helium video. How did that happen? “I think like anyone we are all constantly analysing our work, our relationships, our creativity, and our ability to succeed. This world we live in is sink or swim and if you want to succeed you must be constantly self improving and pushing forward. I did over a year of strictly client projects with nearly zero passion projects and it was killing me slowly. I know from other people in the industry that if there isn’t a healthy balance you can get burnt out very quickly. I have this thing called Helium and I’m ready to just out into the world and maybe you can be the one to do it. What were the obstacles you faced and how did you overcome them? “Time was the biggest obstacle without a doubt. There was ZERO time for this shoot. From the moment I got the green light I was working until 3 AM every night to ensure everything was ready for our 23 hour shoot on Tuesday. This film ideally needed to be shot over the course of 3 days but it just wasn’t possible considering the deadline so it all had to be crammed into one day. I mean I didn’t even have the main talent locked down until the night before the shoot. However, everything came together quite nicely and everyone pulled through. Another obstacle we faced was the extras for the crowd in the underground fight club scene. The schedule for the shoot was insane and the fighting scene took place from Tuesday at 9 PM to Wednesday at 5 AM. Midway through that time frame, the extras started to leave so I had to devise a plan to shoot all of actual fighting with crowd in the background as quickly as possible. Filmmaking is all about problem solving and this shoot was one big equation that needed to be solved throughout all 23 hours. How was it working with 8K files? Tell me a bit about the workflow. “Workflow wasn’t too much of a hassle. We figured that Premiere Pro wouldn’t have support since the camera was unreleased. So the RED techs gave us the latest version of REDCINE-X Pro, which was unreleased at the time. With that version we were able to transcode the footage to ProRes. 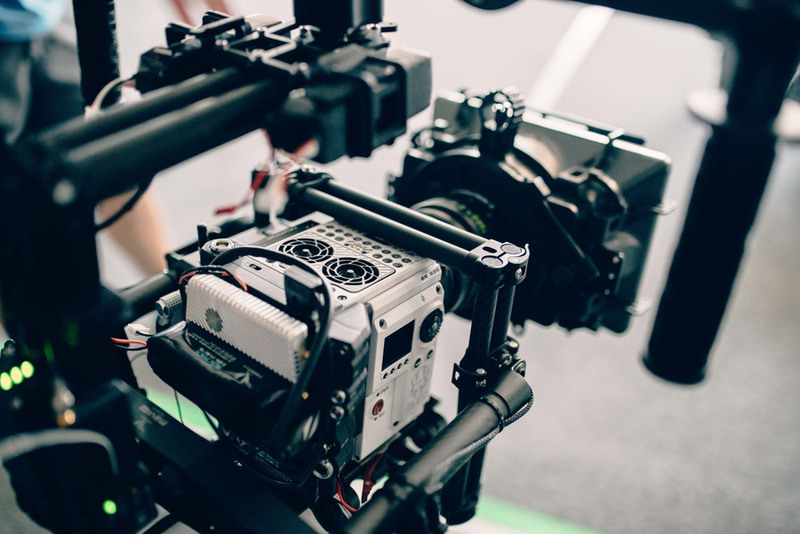 We did a few test exports with the RED techs in various formats, resolutions, and bitrates and found the fastest option would be a 2K ProRes 422 LT file. After everything finished transcoding we edited the 2K footage in Premiere Pro in an 8K timeline. Once the edit was locked, we sent an xml of the timeline over to REDCINE-X Pro and batched all the .r3d clips into a bin. Next we created an export preset for 8K ProRes 4444 and exported all of the 8K .r3d files that were used in the locked edit. Once the 8K files were exported, we replaced the used 2K ProRes files with the 8K ProRes files. Tell me a bit about the workflow of the color grade. “We had the LUTs loaded into Premiere Pro. Using Lumetri we were able to cycle through the LUTs until we found the desired look for each scene. Once the ideal look was set, we tweaked the exposure adjustments and minor white balance. Which LUTs did you use? “For the exterior night scene we used Opal from the cine looks category of the Professional Package for that teal and orange contrast. For the flashback scenes we used Cassiterite from the contemporary color films category of the Professional Package for the more flat and warm look. The color directly correlates to different times from the past to the present during the story. Would you say that without the LUTs you wouldn’t be able to turnover this fast? What is it that you most like about our LUTs? Could you share with us your thought on RED Helium’s image? Any advice for shooters using our LUTs with RED cameras? “RED did an outstanding job with this new sensor, like they do with all of their sensors. The dynamic range and the lowlight performance in Helium were outstanding. We shot ISOs as high as 3200 without a spec of noise, truly impressive. What would you say is the most important thing you have learned about color grading? “Color contributes greatly to how the film feels and the emotions that it evokes. From years of filmmaking and watching movies we are able to associate certain color grading with certain types of films. Knowing what certain color triggers what emotions in the viewer’s brain gives me the ability to have a ton of control. For example in ‘The Underdog’ there are 3 different types of color grading. For the boxing match scene I went for a very dark blue grade, the training flashbacks were all slightly more flat and warm, and the childhood flashbacks were very warm and bright. Let’s talk a bit about camera motion. It’s hectic, it’s fast, it’s on fire. Tell me about that. 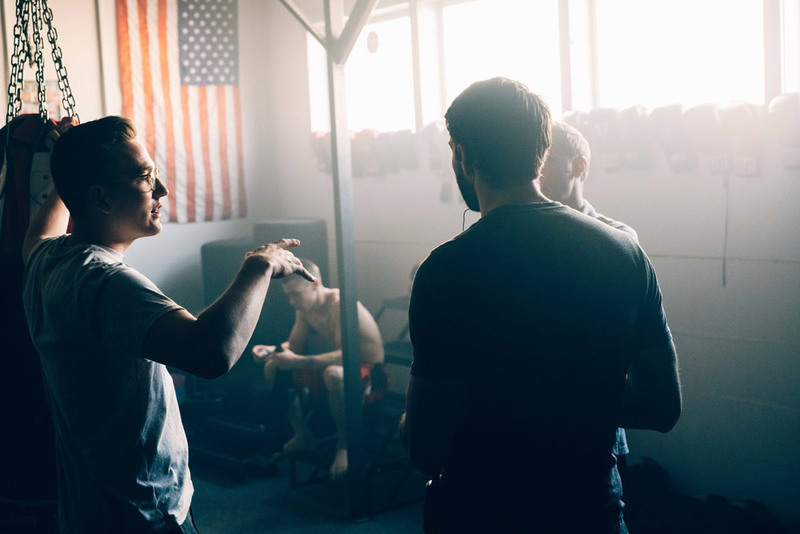 “Over the years, I believe the most important thing I’ve learned is directing motion properly. A good example of this can be seen in ‘The Underdog’ when I had the camera push in really fast as our underdog was hitting the box bag. 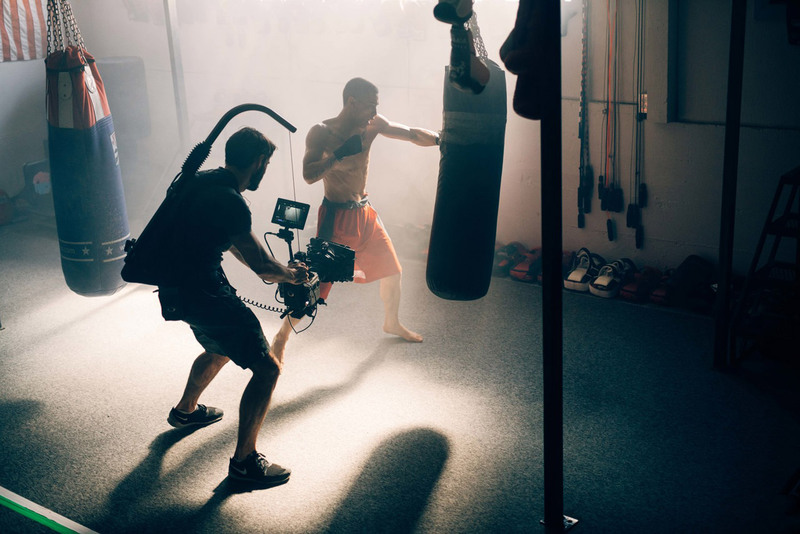 The aggressive camera move, mixed with the quick punching against the bag with sweat flying off, showed just how devastating those punches really are. We had a few POV shots from the trainer’s perspective as the underdog was hitting the mitts. We added some lens distortions as he hit the camera, to emulate what it would look like from the trainer’s perspective ultimately making the viewer feel like they are in the ring. What do you mainly shoot today? What is it you like about it? What is your advice to the less experienced photographers out there? “Shoot, shoot, and just when you think you’ve shot enough, keep shooting. If you work hard and you are passionate about the images you create you will move forward at lightening speeds. Filmmaking is about collaboration so start connecting with as many people as possible and start making magic. Thank you Jonny for taking the time to do this interview. It was a pleasure! Keep doing the excellent work that you’re doing. Jonny was kind enough to share with us some 8K frames from his short. Download them here. Edit: Download no longer available. Filed under Color Grading, Interview. Tagged 8K, Behind the scenes, Interview, Jonny Mass, RED Helium, RED Weapon. This is brilliant marketing by RED. As Steve Jobs once said, people are wowed by numbers. 19 year old with a $60k camera in 24 hours.